A 45-year-old nonalcoholic obese [body mass index (BMI): 31 kg/m 2 ) male was referred from a private hospital to our intensive care unit (ICU) with diagnosis of severe acute pancreatitis on the third day of his illness. At the time of admission in the ICU, he was conscious but irritable, pulse rate was 120/min with warm peripheries, blood pressure 135/65 mmHg, central venous pressure (CVP) 4-5 mmHg, respiratory rate 20-24/min, and urine output 40-50 mL/hr. The abdomen was distended and intra-abdominal pressure was 16 mmHg. At admission, the Acute Physiology and Chronic Health Evaluation II (APACHE II) and Sequential Organ Failure Assessment (SOFA) scores were 7 and 2, respectively. His laboratory reports [Table 1] and ultrasonography of the abdomen (bulky pancreas with no sign of biliary sludge or stone) was suggestive of hypertriglyceridemia-induced pancreatitis. The patient was kept nil by mouth with free drainage of nasogastric tube. Parenteral nutrition was started along with insulin infusion to maintain blood sugar <150 mg/dL. Gemifibrogil 600 mg tablet was given twice daily with atorvastatin 20 mg once a day. Plasmapheresis was planned for hypertriglyceridemia but the consent for the procedure was not given by his relatives. By then, his triglyceride (TG) level reduced with clinical improvement and he was transferred to the ward. Repeat ultrasound after 10 days showed no peripancreatic collection and he was discharged home in a stable condition. Hypertriglyceridemia can be either primary or secondary. Secondary hypertriglyceridemia is associated with insulin deficiency, insulin resistance, or elevation of counter-regulatory hormones as seen in diabetes mellitus, obesity, pregnancy, alcohol, and with certain drugs like beta blockers, thiazides, and so on. , In uncontrolled diabetes, hypertriglyceridemia occurs due to the decreased activity of lipoprotein lipase enzyme (LPL) which hydrolyses the TGs into fatty acid that enters muscle cells to be utilized as a source of energy and in fat cells to get reconverted into TGs and get stored. 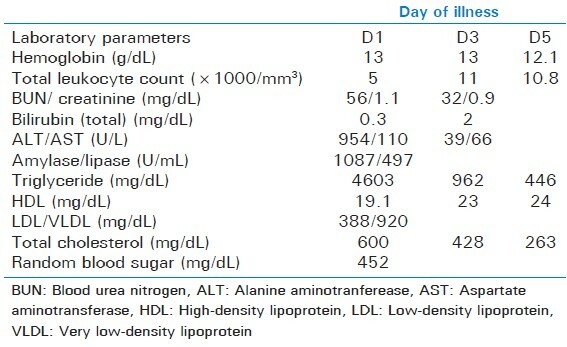 In our patient there was no family history of primary hypertriglyceridemia. However, his initial blood sugar (452 mg/dL) and glycated hemoglobin (HbA1c) (11%) levels were suggestive of undiagnosed diabetes mellitus. The clinical picture of HTGP is indistinguishable from other forms of pancreatitis. It is important to note that TG levels come down rapidly once the oral intake is stopped. Therefore if TG levels are not done early, it is possible to miss the diagnosis of hypertriglyceridemic pancreatitis and the patient might not receive specific therapy. All patients of pancreatitis with predisposing factors for hypertriglyceridemia should be evaluated for raised TG levels in the early phase, so that specific treatment could be provided with better outcome. 1. Ewald N, Hardt PD, Kloer HU. Severe hypertriglyceridemia and pancreatitis: Presentation and management. Curr Opin Lipidol 2009;20:497-504. 2. Tsuang W, Navaneethan U, Ruiz L, Palascak JB, Gelrud A. Hypertriglyceridemic pancreatitis: Presentation and management. Am J Gastroenterol 2009;104:984-91. 3. Khan AS, Latif SU, Eloubeidi MA. Controversies in the etiologies of acute pancreatitis. JOP 2010;11:545-52. 4. Chang YT, Chang MC, Su TC, Liang PC, Su YN, Kuo CH, et al. Association of cystic fibrosis transmembrane conductance regulator (CFTR) mutation/variant/haplotype and tumor necrosis factor (TNF) promoter polymorphism in hyperlipidemic pancreatitis. Clin Chem 2008;54:131-8. 5. Yadav D, Pitchumoni CS. Issues in hyperlipidemic pancreatitis. J Clin Gastroenterol 2003;36:54-62.